River Canal Rescue reports four vessels have been re-floated or removed from the water and one is waiting for a lift-out. 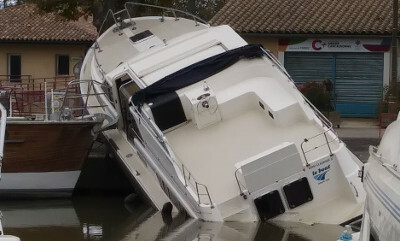 This was following requests to help recover boats from the Canal du Midi in south western France last week. All but one of the boats belong to one of the largest EU hire firms and RCR directors Stephanie Horton and Trevor Forman were called to the area to advise on the re-floats and to see if their rescue teams were needed. Under their guidance, the recoveries were undertaken by the hire boat team. "This vessel was caught in the worst of the floods and it came to rest on the lock entrance barriers. It was jacked back into the water and pumped out prior to re-floating, and has sustained considerable damage. “The boat with its bow vertically out of the water, Royal Classic, was a tricky job as it was locked into position with a wooden cruiser whose bow rail and anchor impacted the side door and window, entangling both vessels. There were also trees and obstacles like mooring bollards, benches etc on either side so the crane driver and hire boat team did really well to refloat it. The boat, Continental 67, had its stern out of the canal so was lifted in and pumped out. 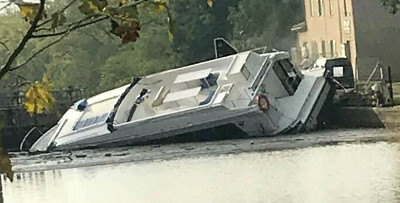 It suffered minor internal damage to the front cabins and when Stephanie and Trevor arrived, the customers explained that when they tried to pump out, water came in. 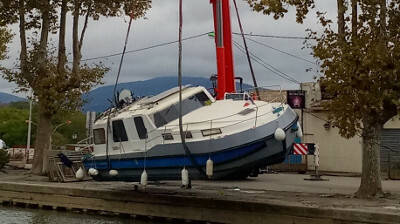 Stephanie and Trevor also assisted in the lifting and shifting of a private American-owned boat. Being completely out of the water, they advised the owner not to refloat it as the rudder was damaged and would need repair first. The only boat that could not be re-floated required the main road to be closed and as the town has so many roads under repair, it was not possible to get permission. However this proved an easy lift and one of the least damaged vessels. 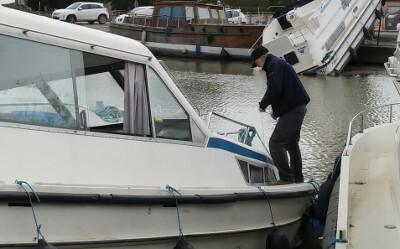 All in all a very successful undertaking, with the boat owners most appreciative of the efforts and knowledge of the River Canal Rescue people.